Outward Sound is the music export office. We provide support for bands/managers/ labels and associated music related businesses wanting to enter overseas markets. Since 2001, over 100 of New Zealand's top artists have enriched the education of students in secondary schools. Call 0800 4 69642 arrange for an appointment. 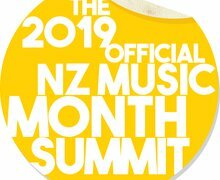 Join us and MENZA to celebrate NZ Music Month with our songwriting contest and nationwide singing event. Taking New Zealand music to the world. Every year we support a wide range of music projects locally and internationally such as NZ Music Month, SXSW and The Great Escape Festival. We're also putting contemporary musicians into schools to develop musical talent as well as offering industry resources to students and teachers. We've got a lot of useful stuff in the Artist Resources section - videos with local musicians and industry figures; statistical information; and a wide variety of educational documents.